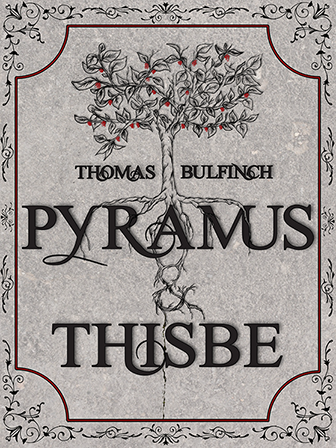 Unbeknownst to many, the myth of Pyramus and Thisbe has been used by writers throughout history; most famously by Shakespeare in A Midsummer’s Night Dream and Romeo and Juliet. Pyramus and Thisbe is the story of two lovers in the city of Babylon who occupy connected houses/walls, forbidden by their parents to be wed, because of their parents' rivalry. They arrange to meet near Ninus' tomb under a mulberry tree and state their feelings for each other. Thinking Thisbe has been killed by a lion, Pyramus kills himself. Pyramus' blood stains the white mulberry fruits, turning them dark. Thisbe returns, eager to tell Pyramus what had happened to her, but she finds Pyramus' dead body under the shade of the mulberry tree. Thisbe, after a brief period of mourning, stabs herself with the same sword. In the end, the gods listen to Thisbe's lament, and forever change the colour of the mulberry fruits into the stained color to honor the forbidden love.